Looking for a solid heavy duty hotel bell man cart that looks luxurious but you are on a tight budget? Well, this CSL Bell-Man Cart is for you! 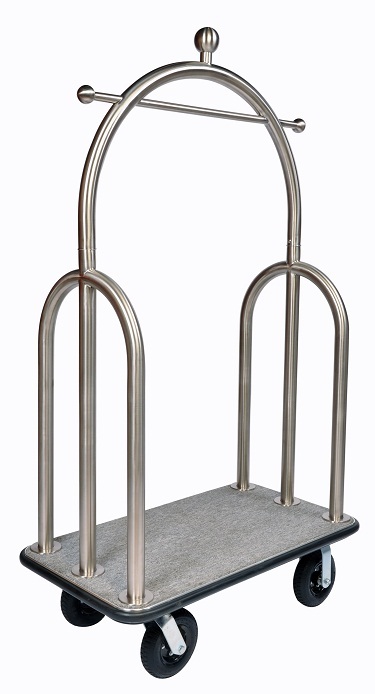 Features a deep plush grey carpet, 2" stainless steel uprights, and 8" pneumatic wheels. All at an unheard of price of $999.99 Including shipping! Choose from three different wheels: Pneumatic (air), Semi-Pneumatic (flat-free), and Polyurethane (flat-free). Order was timely and great communication from start to finish. Advantages: I like that I got updates when the products ship.